December Calendar For The English Cottage Garden. Cottage garden December calendar. Thing’s to do in the cottage garden this month. December is the month the cold weather really settles in. It’s a time when we would rather be inside cosy and warm. While you are sitting by the fire with your cup of tea spare a thought for what lives outside. Your plants may need some help to keep warm or be removed to the green house and birds, hedgehogs, frogs and all kinds of wildlife may need a helping hand. December is the month to have a good clean up of the garden and greenhouse, check up on any stored fruit or bulbs and remove any rotting or diseased ones. While you are cleaning up outside if you see a hedgehog hibernating put the leaves back on top of the hedgehog and leave the area wild with a little shelter if you can, you can also leave out water and cat or dog food if you have some. They are wonderful at getting slugs and snails so make them comfortable so they stay a round. If you have a pond help frogs and wildlife by melting any ice with a boiling pan of water, just put the pan on the ice and it will melt a circle, do this a few times, and for extra measure remove some water from under the ice layer to get air circulating below the ice. This will keep the water in your pond from becoming stagnant and will allow any trapped wildlife an escape route. For more about helping birds read the Cottage Garden November Calendar. Remember your plants, wish them a Merry Christmas too! Temperatures vary all over the country and your garden will have it’s own micro climate so take that into consideration. You may need to adjust this December calendar a little for your own cottage garden but it’s a good place to start. December Calendar: Flowering Cottage Plants. 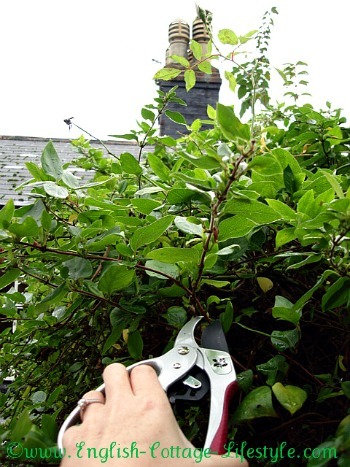 Tidy up any unruly perennial climbers and prune herbaceous perennials. Light prune roses if they are tall to protect form any buffeting winds. Clear the ground of any old rose leaves. Prune overgrown shrubs: Buddleia, Chaenomeles speciosa (Japanese quince), Cotoneaster horizontalis, Forsythia, Lavatera olbia (mallow), Philadelphus, Potentilla ‘Glory of Nancy‘, Salix, Spiraea trifoliate, Syringa (lilac) and Viburnum tinus. Take root cuttings and hardwood cuttings to improve your stock. Keep an eye on container plants and wrap with bubble polythene or Hessian sacks to protect from frost. Keep and eye on stored bulbs for any disease remove if you find any. Bring forced bulbs into a warm room. Improve soil between plants by adding organic compost. December Calendar: Herbs, Vegetables, Soft Fruit and Fruit Trees. Harvest Time: Brussel sprouts, cabbage, carrots, horseradish, kale, leeks, spinach, swede, swiss chard, turnips, winter salad leaves. Plant garlic cloves in the greenhouse. Garlic is not traditionally a cottage garden plant but I grow it as I love cooking with it. I recommend the Garlic Farm on the Isle of Wight for the best British garlic. Luckily the Garlic Farm has a stall in Borough market in London or order online…superb! Lift and divide congested clumps of Rhubarb. Prune apple, pear and quince trees. You don‘t have to do it all at once spread the job out over a few weeks. Prune gooseberry and currant plants take hardwood cutting from gooseberry. Cut back raspberries and summer fruit. Check all stored fruit for any diseased or rotting fruit and remove them. 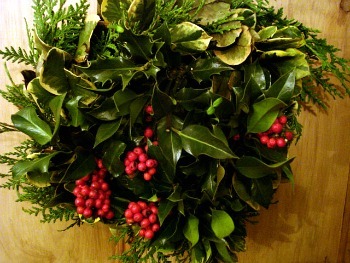 December Calendar: General Cottage Gardening Jobs. Check all ties and stakes to make sure the ties are not too tight and the stakes are secure. 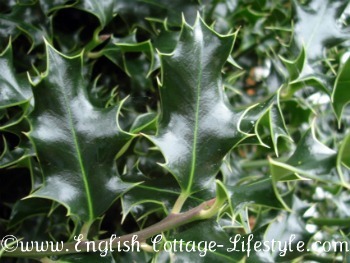 Protect any holly that has berries from the birds with netting if you want to use it in Christmas decorations. If there is snow on any branches on shrubs and trees knock it off. Have a general tidy up. Clean floors and pathways so that they are not slippery. Bring Bay leaves under cover and protect them from the cold. Order any plants and presents for Christmas.